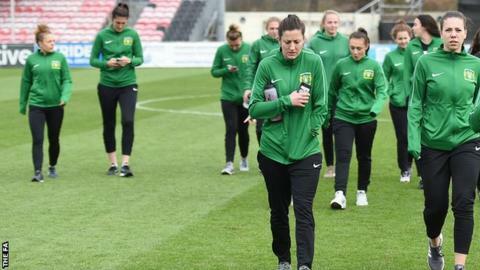 Women's Super League side Yeovil Town may revert to part-time status at the end of the season amid concerns over their finances, BBC Sport understands. The Somerset club are making cuts to their staff, serving three key off-field personnel with their notices. The Football Association is understood to have provided a scheduled payment to Yeovil earlier than planned, helping the club complete the current campaign. Yeovil, who won the second-tier title in 2016, are bottom of the WSL. The Glovers switched to full-time, professional status last summer after obtaining a licence from the FA, which runs the WSL. A Yeovil Town Ladies spokesperson said: "The FA has been extremely supportive and we are working closely with them to bring about a positive resolution to these issues. "We remain committed to delivering girls and women's football for the community in the south west." Following a restructuring of the English women's divisions in 2017-18, all clubs competing in the top flight had to be full-time. Yeovil's community-focused application was successful, but turnover this season has not been as high as hoped or anticipated, and all full-time off-field staff have been made redundant, including the general manager, assistant general manager and communications manager. As a result, the club could drop down to tier two even if they avoid WSL relegation on the field. They are five points adrift of safety, with five matches to go, following 13 March's draw with ninth-placed Brighton. An FA Spokesperson told BBC Sport: "We are aware of the situation at Yeovil Town Ladies and we are in contact with the club. We are not in a position to comment further at this stage." Should that happen, Yeovil would not be the first top-flight women's side in recent years to see financial problems contribute to them dropping out of the WSL. In 2017, top-tier Notts County Ladies folded on the eve of the Spring Series, just two days before their first scheduled match of that campaign, leaving many of their "gobsmacked" players "jobless and homeless". Then last summer, Sunderland dropped down two divisions, from the WSL to the Women's National League North, after they were unsuccessful in their bid for a licence to play in one of the top two divisions. Yeovil were among the sides to join WSL 2, upon the breakaway league's expansion to include a second tier in 2014, after finishing third in the 2012-13 Women's Premier League Southern Division. Fifth and fourth-placed finishes then followed in the second tier, before they pipped Bristol City to the WSL 2 title under manager Jamie Sherwood in 2016. Promotion capped a remarkable rise for the Somerset side, four years after "playing in a park". The team then found life difficult in the top tier, taking one point from eight games in 2017's transitional Spring Series, as the top women's leagues moved from a summer to a winter calendar. While competing as a part-time side in what was a predominantly full-time division, they then finished bottom of the 10-team top tier last term, with two draws from their 18 games. Former Millwall Lionesses boss Lee Burch was appointed as head coach last summer - as former first-team boss Sherwood became director of football - and the club moved to play their home matches at Dorchester Town's Avenue Stadium, approximately 20 miles from Yeovil. After full-time criteria was implemented for all top-tier clubs this term, the Glovers have won one and drawn one of their 15 league games so far, to sit four points behind 10th-placed Everton. During the 2017-18 season, the club had expressed concerns about the speed with which the FA was introducing full-time criteria, and they attempted to raise £350,000 to support their bid for full-time status. Just £1,941 was pledged via the public Crowdfunding page but nevertheless the club managed to put together a successful application, before unveiling a new board in August, with the support of multiple local businesses, followed by Gary Dawkins' appointment as chairman in October.